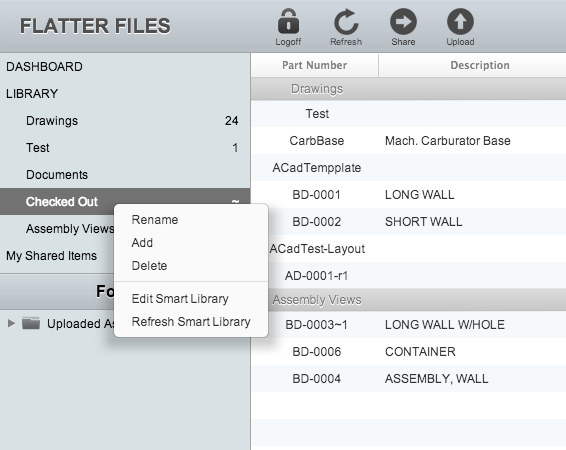 Flatter Files now includes the ability to create Smart Libraries. 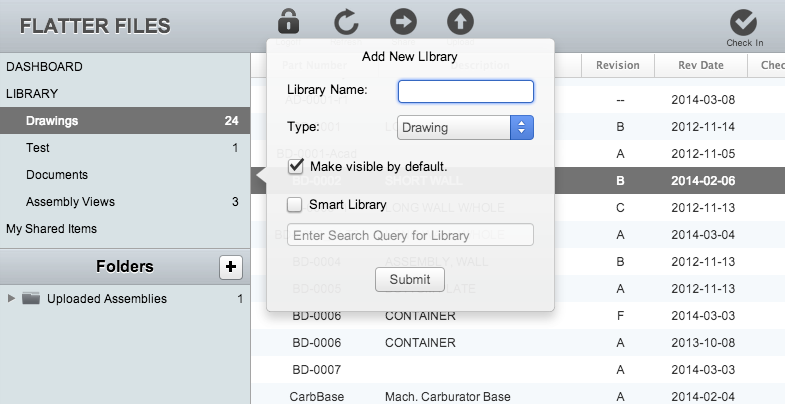 Smart Libraries contain all of the Drawings and Assembly Views within your account that match a specified search query. For example, if you want a library that displays all of the currently checked out items in your account, you can simply create a Smart Library for this search and the library will always be shown such that you can easily view all of the items currently checked out. Just like other custom libraries, you can control who within your account has access to this Smart Library. With this latest update, when you create a new library you are shown the additional Smart Library options. To create the Smart Library, you simply enter the library name, check the Smart Library option, and then enter the desired query. Select the Smart Library option. Enter the query "checkedout:yes" into the field. 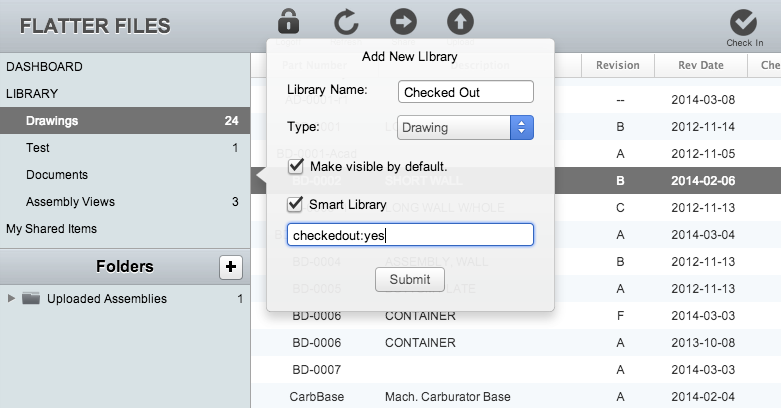 The image below shows the inputs to create the Smart Library for checked out items. The library has now been created and the image below shows the result. As you can see, the Smart Libraries appears just like other libraries except that the count for the number of items does not exist since this number can continually change. This new Smart Library can still be renamed or deleted just like regular libraries by right clicking on the library and then selecting the desired option. In addition to the standard options, the Smart Library query that is used to generate the content in the library can be edited and the result in the library can manually be refreshed. These right click options for the Smart Library are shown below. Flatter Files has recently been updated to allow you to retrieve specific stats regarding the links that you share outside your company. Stats for your shared items provide a great mechanism for ensuring that the vendors or partners that you have shared the item with are actually accessing the item as it is updated. Right clicking on a shared item now includes two additional menu items. The first is Access Stats and the second is Update Stats. The image below shows both of these new menu options. 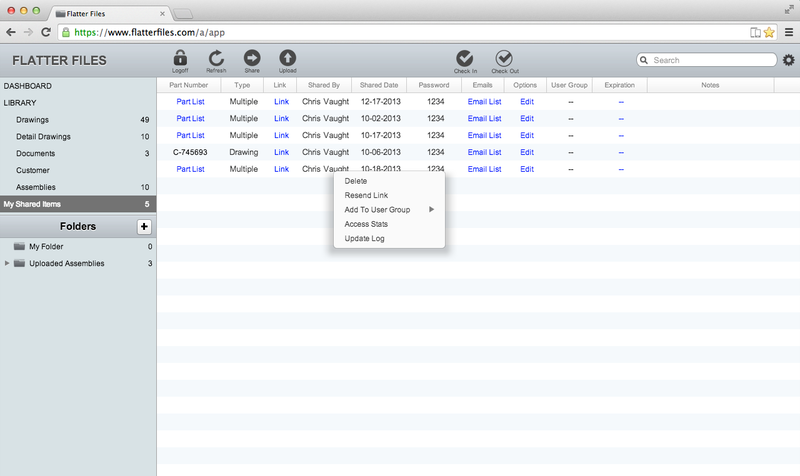 Access stats show how many times the shared link has been accessed by each email. The image below shows a table listing each email that has access to the item, the last time they logged in, and the number of logins in the last 30 days. 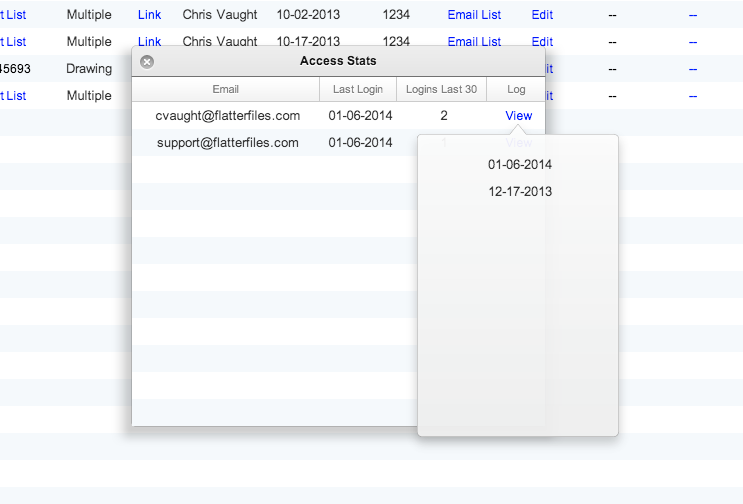 Additionally, a log of each individual login can be displayed by clicking View, which is shown in the second image below. In addition to the access stats, you can also view an update log that shows when and what was updated with regard to the particular shared item. For example, one of the drawings might be listed as updated or if you add items to a shared link the item added will be listed as being added. 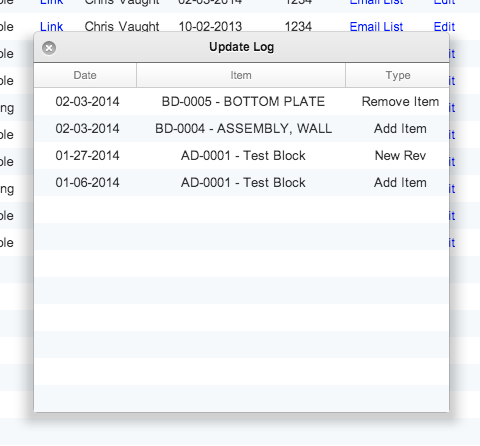 An example update log is shown in the image below. A monthly shared item stats email that summarizes the stats for all of your shared items can also be configured to be sent by the account administrator. 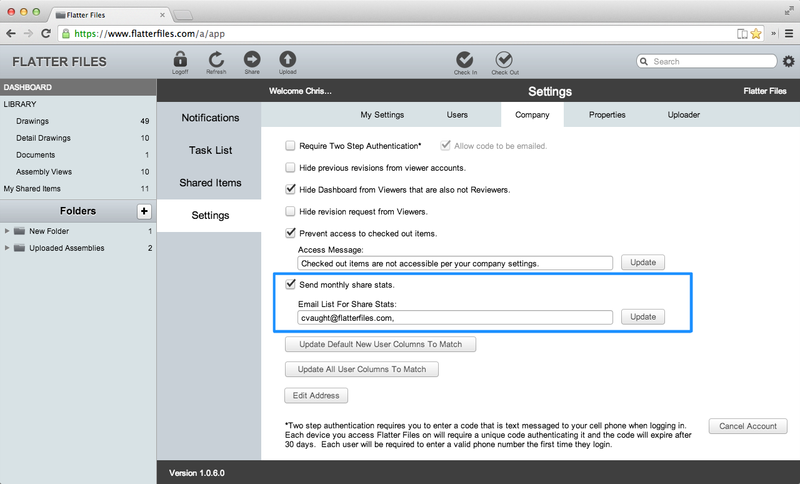 To configure, go to your Dashboard, click Settings, and then click Company. There is an option under company settings that allows you to turn on and then enter the email addresses that should receive the monthly email. This email is sent on the first of each month. The option for turning on the email is shown in the image below with the blue box around it. 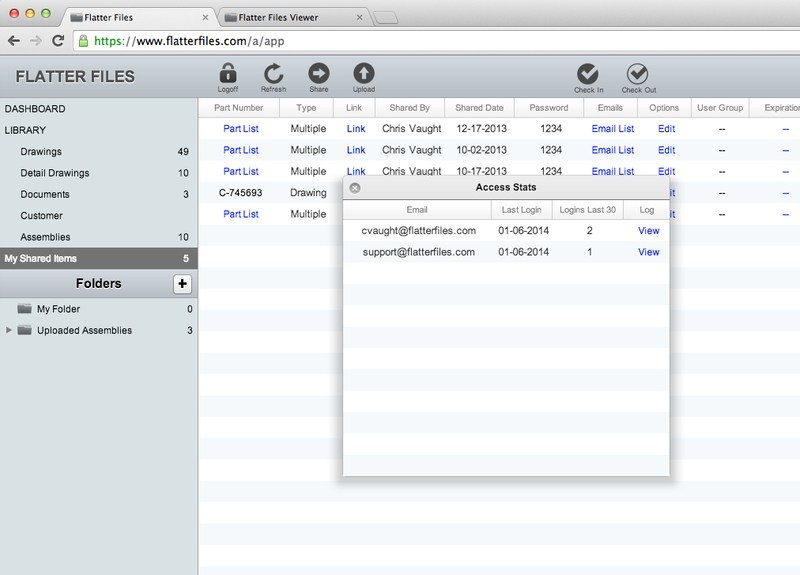 Easily creating and controlling shared links is a big part of Flatter Files. With these new features, not only do you have complete control on who can view your content but you can now find out if they are actually accessing the item when they say they are accessing it. Flatter Files will be at SolidWorks World 2014, which is being held in San Diego, CA at the downtown convention center. The show starts on Sunday January 26th and wraps up on Wednesday January 29th. If you are planning to attend the show please stop by our booth. We would be happy to show you Flatter Files. Our booth number is 739-G. Ever since we integrated Flatter Files to work with EPDM, we have often gotten the question of why should an existing EPDM user add Flatter Files to their implementation. This blog post will specifically outline the major benefits, which includes access to your content for everyone and everywhere, all content in a central location that is searchable, assembly views, and shared links. Once everything is set up, all content is available by anyone within your organization that has an internet connection and a web browser at no additional charge. In addition, a free mobile app for iPhone, iPad, and Android can be used to access the content on your mobile devices. This means that you no longer need EPDM view licenses for everyone that simply needs access to the data (managers, salesman, purchasers, etc...). In addition, companies have found that the amount of training and maintenance for employees that only need access to the drawings is also much lower when using Flatter Files. An unlimited amount of content can be uploaded to Flatter Files. Thus, no one ever has to wonder where the drawing is kept or ask the CAD team to find a drawing for them. They will simply go to Flatter Files and the drawing will be there. All property data associated with the drawing is uploaded and searchable. Making it super fast to find the drawing you need. If your models consist of quite a few assemblies then Flatter Files can save you a lot of time. The Uploader app not only creates and uploads a PDF of each drawing but it also uploads the bill of materials data. Once the data is uploaded, assembly views are then automatically created. An assembly view contains all of the individual parts and sub assembly drawings needed to make a specific item. Many companies spend many hours creating a PDF that contains all of the drawings in an assembly. With Flatter Files these PDFs are automatically created. 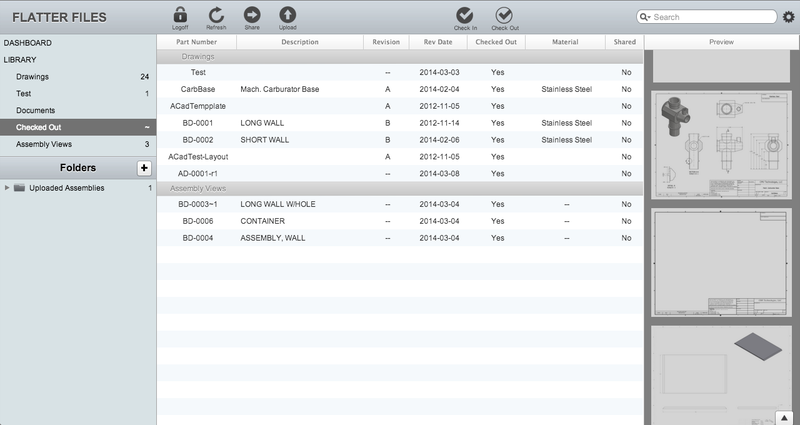 In addition, as revisions are created to the individual drawings the assembly view PDFs are automatically updated. Flatter Files also provides a really convenient way for drawings to be shared with vendors or other partners outside your organization. Instead of emailing a PDF or drawing file, you send a link. This link provides password protected access to the content, which can include multiple drawings and/or assembly views. Optionally the CAD files and previous revisions can be included. Once the link is created, it doesn't change. Meaning that as you create new revisions the vendor can simply return to the same link and the latest version is always available. This can save your purchasing department a lot of time if you work with lots of outside vendors. At any point the link can be deleted removing access to the content. You can also track the number of times each person is accessing the link to ensure it is properly being used. 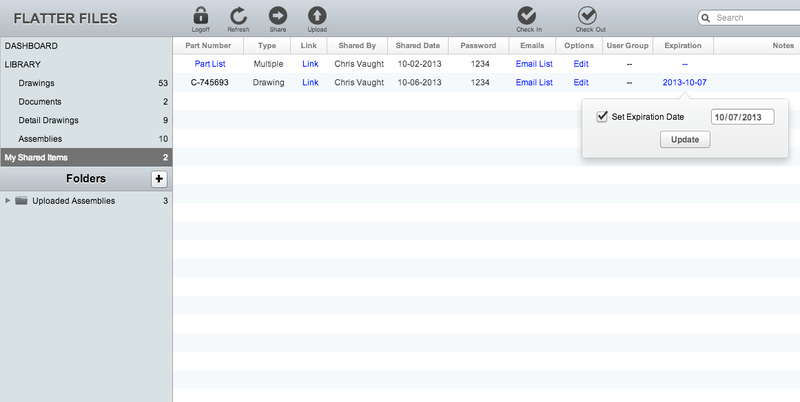 Two new settings have been added for when sharing a drawing or document. The first is that whenever the file's revision is changed an email can automatically be sent notifying the receiver that the drawing or document has been modified. The second setting that has been added is the ability to set an expiration date to the shared item. One of the major benefits to using Flatter Files is a significant reduction in errors caused by using outdated drawings. By using link based sharing within Flatter Files, all of your outside partners can also know that the link they have been sent is always up to date. It is possible that a partner might forget to visit the link each time to make sure they are using the latest drawing. Therefore, shared items now include an automatic email to everyone that has received the shared link whenever the drawing changes. When sharing an item, you are able to select whether you these emails should be sent. 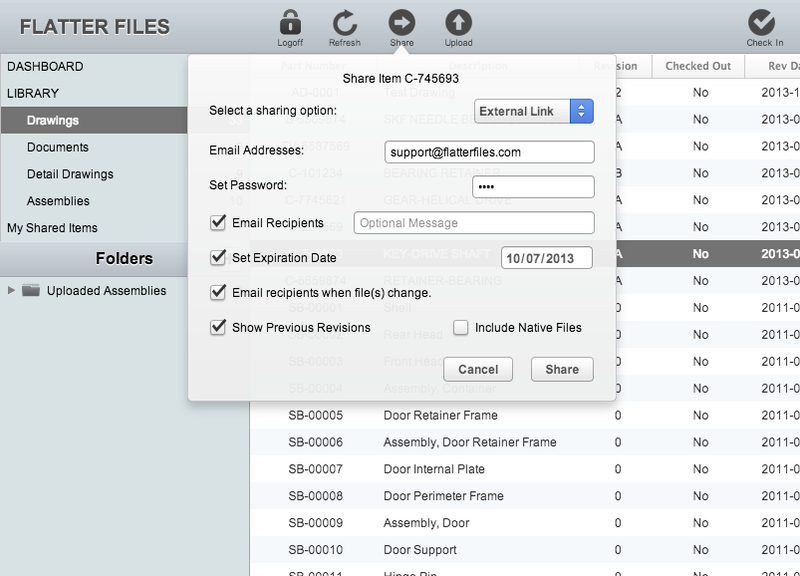 This option is called "Email recipients when file(s) change" and is shown in the share menu below. This setting can also easily be modified within "My Shared Items." Simply click the "Edit" link in the "Options" column. A dialog will appear that includes the option for automatically sending emails when the drawing or document changes. The first image above also shows the ability to set an expiration date. This is an optional setting that simply denies access to the drawing or document once the date has been reached. 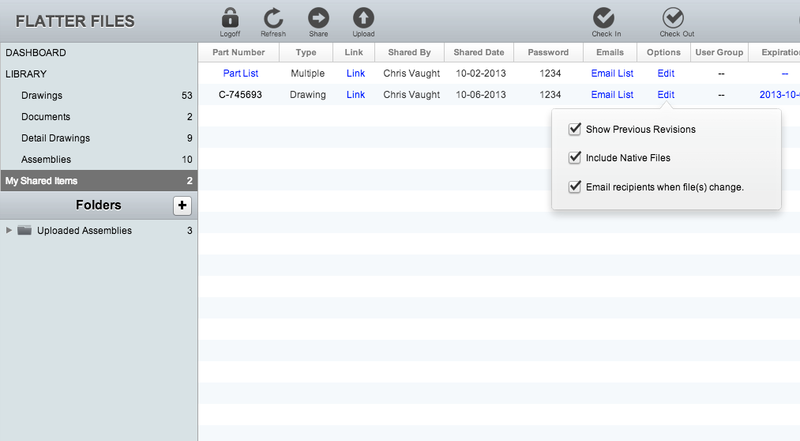 Once the item has been shared, you can easily manage the expiration date in "My Shared Items" which is shown below. At any point, you can modify the date, remove the expiration, or add an expiration date to an existing item. An expired shared item can still be edited as well. Once it expires, it is simply shown as expired and no longer accessible. To make it accessible again, simply edit the expiration date to a new date in the future.